I finished my MIDAS hat last night. I used the gradient yarn from Sue (Mrs. Micawber). By the way everyone in the SWAP did a great job of gifting their partner with goodies by July 3rd. This is MY hat. I just needed a model this morning. Check out the free pattern on Ravelry. It does involve a provisional cast on, and some of you asked about the method. In this particular knit, you just need to cast on with a different piece of yarn. Then join it to your yarn that you want for the hat. This way when you fold up the knitting to knit from the edge of the brim to the most recent live stitches, you can see the brim stitches easily. You knit the two together to create a thick, lovely warm brim. There was no need for me to remove those stitches. They don’t show under the hat. Clear as mud? *If you want a great story of hope, in light of the Thai soccer kids predicament, read DEEP DOWN DARK the story of the trapped Chilean miners. It is one of my favorite reads. * MY GLORY IS I HAD SUCH FRIENDS is a book that Al recommended I read. It looks good. It is an organ transplant story. And then you whipstitch the provisional CO to the inside of the hat? love the hat and the gradient yarn!! Great hat-I love this kind of brim! You did a great job! Such a pretty hat. I love the yarn. I think most of the country must be experiencing heat. It did briefly pour rain at 11:00 p.m. on the 4th. What do I think of on the 4th? My daughter’s birthday is July 3 so I have the sweetest memory of having her in the crook of my arm in a hospital bed (back in the day – we stayed longer than 24 hrs – remember?) and watching fireworks. For quite a few years, she thought the fireworks were for her birthday. Lordy, I hope you have AC, making him model a winter hat in this ridiculous heat! It looks good, by the way! 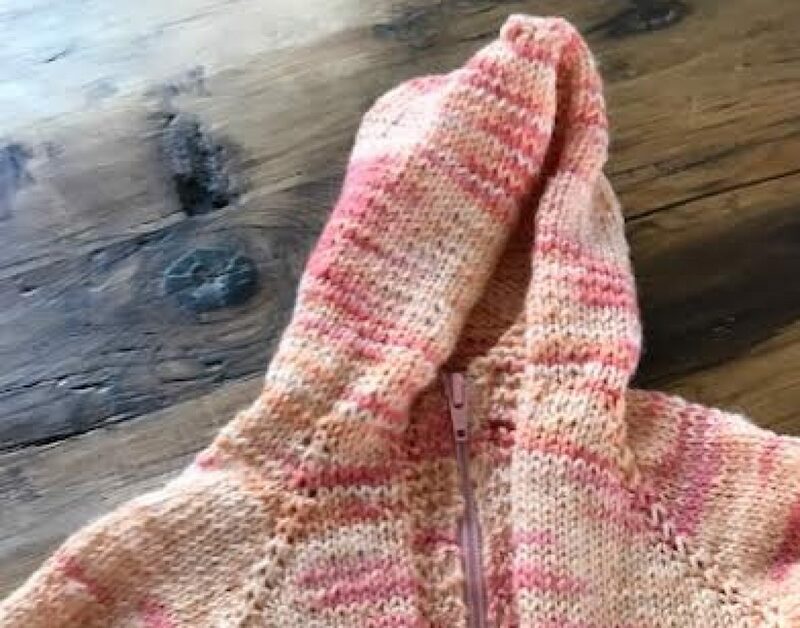 The pattern and yarn are a perfect match. The gradient really comes through! Great hat! I find it hard to believe you found a willing model in this weather. Good for you! Not sure if you saw my response to your comment on my post, but Hector Tobar (the author of Deep Down Dark) was my colleague for a few years here. Now he’s at some school in LA. I LURVE that hat and the yarn is PERFECTION! Looks like a nice, snuggly hat. I love that gradient too. The gradient color is fabulous! Bravo on finishing a fabulous hat! The double edge will keep your ears warm and stop the wind.